I am now based in the Portland, Oregon, metro area. 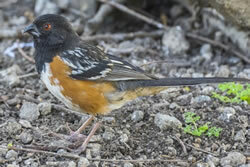 I am still leading birding tours from Big Sur north to Puget Sound. 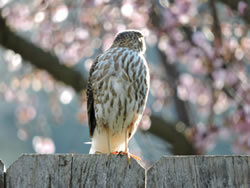 I continue as a founding partner of Partnership for International Birding. Click here to see our full schedule of trips, both domestic and international. In 2015 I published a new book, Great Gray Owls of California, Oregon and Washington. It was co-authored by Peter Thiemann who also supplied over 100 original photos of this phantom of the forest. This is the first book about this southernmost population of this elusive species. The Great Grays of the Pacific Slope nest as far south as Fresno County, California. They are notoriously hard to find even by skilled field biologists. The first Oregon nest of the species was not found until 1954, and the first nest in Washington State was not found until 1991. Click here for page explaining more about the book and how to order. My book on Freeway Birding, San Francisco to Seattle is still in print. This book covers good birding locations with detailed maps and info on what birds toexpect and when. It covers locations within 20 minutes drive of any freeway exit along with locations such as rest stops or roadside birding habitat to be viewed at 65 MPH. Click here for more information on that book and how to buy it. Click here for more information on that book and how to buy it. After several years birding across Oregon I heartily recommend birding at Malheur National Wildlife Refuge in east central Oregon. It is an oasis of marsh and fluctuating lake basin surrounded by arid sagebrush steppe, from 4000 feet elevation on up. 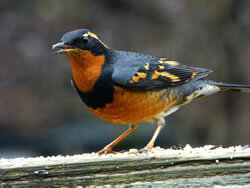 For birders from the eastern U.S. it is great place from April onward. Specialties include Ross’s Goose on spring migration, resident Greater Sage Grouse, Cinnamon Teal, Wilson’s Phalarope, Long-billed Curlew, Yellow-headed Blackbird and Brewer’s Sparrow. For folks from the Pacific Coast it is a great place to pick up Great Basin birds: Sagebrush Sparrow, Sage Thrasher, Franklin’s Gull, Eastern Kingbird, Bobolink, Prairie Falcon, Short-eared Owl, Swainson’s and Ferruginous Hawks and many views of pronghorn. If you want to visit the Klamath Basin in any season I can offer guiding services or simple advice. Some difficult to find birds in Southern Oregon and Northern California can be found with some good local advice, try me: Vaux’s and Black Swift, Allen’s, Rufous and Calliope Hummingbird, Great Gray Owl, Western Screech-Owl, American Dipper, California Towhee, Green-tailed Towhee, Wrentit, Vesper Sparrow, Lincoln’s Sparrow, Mountain Quail, Sooty Grouse, Townsend’s Solitaire, Nuttall’s, Lewis’s, Acorn, White-headed and Black-backed Woodpecker, Red-breasted and Williamson’s Sapsucker, Hermit and MacGilllivray’s Warbler, and those western “rockpipers” like Black Oystercatcher, Black Turnstone, Surfbird and Wanderin’ Tattler.